A View to a Kill (1985) is the fourteenth spy film of the James Bond series to be produced by Eon Productions, and the seventh and last to star Roger Moore as the fictional MI-6 agent James Bond. 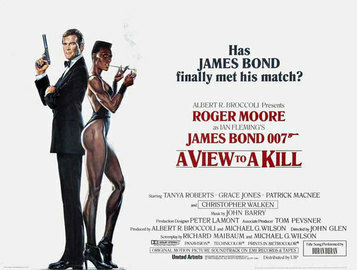 Although the title is adapted from Ian Fleming's short story "From a View to a Kill", the film has an entirely original screenplay. In A View to a Kill, Bond is pitted against Max Zorin, who plans to destroy California's Silicon Valley.